The PrimeSight stroboscopy system allows physicians an affordable way to integrate stroboscopy into their flexible video endoscopy system. Our compact unit replaces the large tower of equipment that was previously necessary for high quality, true flashlight stroboscopy. Featuring two primary modes for visualizing vocal fold vibration, the PrimeSight STR-5000 system streamlines the combination of standard laryngoscopy with stroboscopy, allowing for a simplified and comprehensive method for the evaluation of laryngeal mucosa, vocal fold motion biomechanics and mucosal vibration. Using the PrimeSight stroboscopy unit with the PrimeSight video system, practitioners can easily move between standard visualization and stroboscopy with a touch of a single button, reducing the need to switch between flexible and rigid endoscopes. 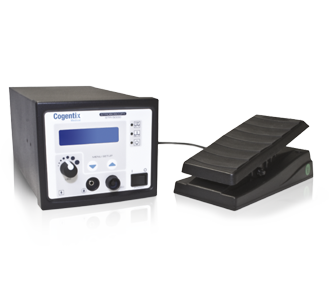 The stroboscopy modes are easily changed using a foot pedal, allowing the physician complete control during the procedure. The PrimeSight stroboscopy unit is used during laryngeal endoscopy. For your convenience, we’ve assembled reimbursement information for endoscopy procedures. Talk to your Territory Manager for more information about how the PrimeSight STR-5000 stroboscopy unit can enhance the efficiency of stroboscopy within your practice.